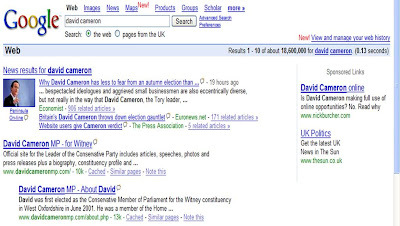 Search is a big opportunity for political parties and politicians - I ran a Search campaign to prove it! I recently wrote about how UK politicians should be using the internet to a greater extent. Of particular note was the lack of a Search / Google strategy that the candidates and political parties had. I then highlighted these thoughts by running my own keyword campaign over the 36 hours when Gordon Brown was deciding whether to call an election. The Conservative party seem to be the most technologically savvy party with sites like www.conservativehome.com, iain dales blog and webcameron. Given the recent branding of the leaders (Gordon's not flash, but 'David Cameron is a hottie') I felt targeting the Conservatives would produce the most interesting results. I bought obvious phrases like 'David Cameron', 'Conservative Party' and 'Vote Conservative'. I bought terms like 'general election', 'november election' and 'snap election' and I bought less obvious terms like 'Webcameron'. - My ad was always on the first page and often in top position. This demonstrates how few people were advertising against these terms. It still amazes me that at a key time the only ads I was appearing against were topical ads from the Sun and the Times - what a missed opportunity for the political parties! - These ads gained a high click through rate - 'general election' generated a click through of 4.25%. This shows how hungry people are for information, and again shows how much of an opportunity Search is for politicians. - The top 3 Searches were on 'David Cameron', 'Conservative party' and 'general election.' However the 'long tail' (the less obvious terms) like 'Webcameron', 'William Hague' and 'snap election' were also searched on and produced low average costs. Overall the results of my political Search campaign back up my theory that Search is a big opportunity for politicians and political parties in the UK! I have emailed him to congratulate him on his initiative and have asked him for feedback but he has declined to respond so far!